In 2015 I received an invitation from Cheltenham Art Gallery & Museum (which had been renamed The Wilson) to submit ideas for a public bench for their new entrance foyer. The new name pays homage to local-boy Edward Wilson, the polar explorer. I went and had a look at the space, and also revisited their wonderful collection of Arts and Crafts Movement furniture - something I was familiar with as I was at college for three years in Cheltenham. I sent them some sketches; I think they had a short-list of about ten designers, and then narrowed it down to two, of which I was one. They were very mysterious about who my competitor was. My original idea was to see this as another Bodging project, and to make a wide, 'bodged' wooden bench with a tall back and a comfortable woven cushion. The bench was to be sited in front of a window and so should not form a barrier. 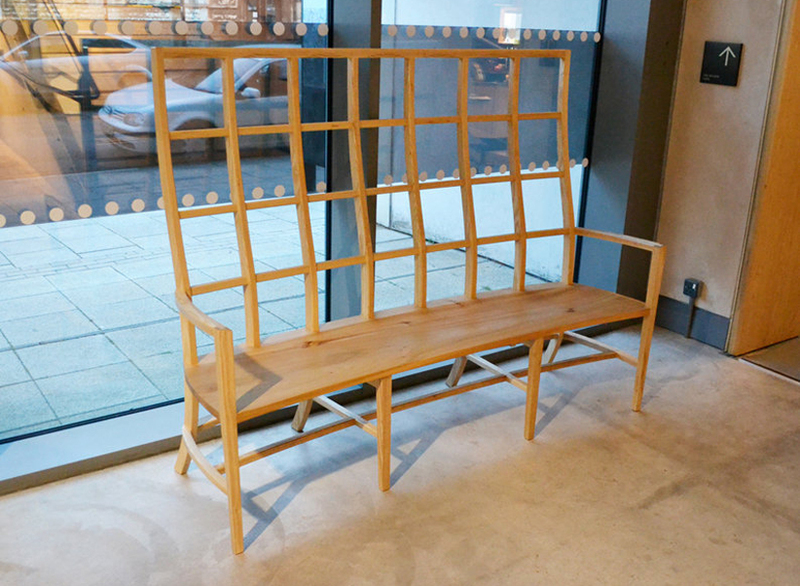 There was a decent budget available - raised by the Friends of the Wilson - so I suggested that a domestic-scaled version of the bench could be batch-produced for sale in the gallery shop - i.e. to continue the Arts and Crafts tradition locally and to raise money for acquisitions. The committee didn't go for this but invited me and the other designer to each work up our ideas. They wanted what they called a 'statement piece' - a one-off. 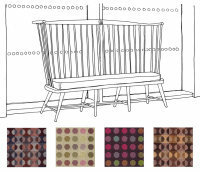 One of my early sketches featured a grid; this was a reference to some of the Barnsley furniture in their collection, the Wilson logo is also a grid, this was more what they wanted. For the resubmission I made a rough scale model of my proposal; a slightly curved bench with a compound-curved grid as a back. This got me the job and so I decided to make a full-size prototype in softwood and mdf, for the committee to see, and for the comfort of the design to be judged. This was approved and so as very accurate cabinet-making skills were need for the final piece I invited Dave Green and his team at Sitting Firm Chairmakers to become involved. We decided on English Ash from Herefordshire for the main structure, with an Elm seat. Dave made a wonderful job of it and the Wilson Bench was formally unveiled at a gallery opening in April 2016. Asked for a statement about the design I said :I’d like the compound curves of the bench’s back to have the feel of a billowing sail – from Wilson's ship ‘Terra Nova’ maybe – with the grid construction referencing some of the Arts and Crafts furniture in the collections held by The Wilson. A further nod to Sidney Barnsley and Ernest Gimson is the chamfer detail to the back, and the arched effect to the top rail. Having said that, this is a modern piece and something, I hope, that will be well-used by present and future generations of visitors to The Wilson.